This project, dubbed Revolution, was my first major programming endeavor. I worked on it heavily in late 1998 and distinctly remember sending it to my friends in middle school and watching with pride as they used it to scroll massive amounts of text in random AOL chat rooms. This was the reason I got into programming in the first place. 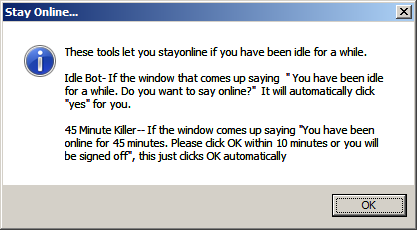 My friend Jake sent me an AOL prog (program) and curious, I set out to learn how to build one. The code is absolutely terrible and the only thing uglier is the design. It was a start. I almost forgot about this program until I was going through some old 3.5″ disks and came upon it. I’m glad I did… I haven’t seen the words “Lagger” or “Punter” or “Fader” in many years. Posted on May 13, 2009 by Mazur. This entry was posted in Programming. Bookmark the permalink. 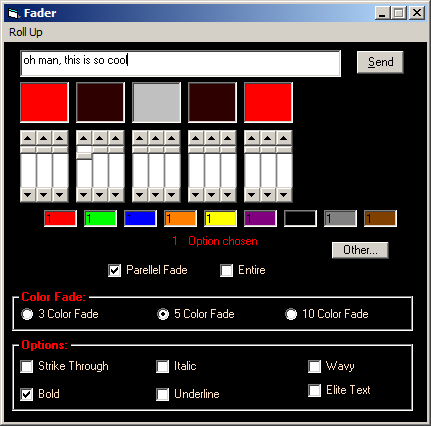 Wow this brings me waaay back..lol and to be honest i think i remember using that prog, my nephew was asking how did i learn i told him aol progz bak in the day, well hope all is going good oh.. on a seperate note:: , if n e 1 has evr used monk-e-fade32.bad file for their old faderz i heard he died sometime last year =(. i came across your site totally by mistake but MAN does it take me back, even found my profile on the archived aol-files site… what a trip man. memories like these are the greatest!